Billy Houliston is the only Queen of the South player to have gained full international recognition with Scotland. As well as his three full caps he was capped nine times in all at different levels for Scotland scoring eight goals. A rampaging centre forward, Houliston was never on a losing international side. Billy Houliston was born in Dumfries on the Maxwelltown side of the River Nith at Westpark Cottages, where he lived for a short time before his family moved to a house at the Crichton. He played for Brownhall Primary School in the Dumfries and District Primary School League at centre half. He played for the League in cup matches against other areas. Houliton’s secondary school was Dumfries High School where he played only occasionally. On leaving school he stopped playing completely. Aged 17, working as a nurse at the Crichton Royal Hospital Houliston started playing again. It was here that he moved from defence to attack, playing at either inside or centre forward. In 1941 Houliston was called up for national service. He joined RAF Coastal Command as a wireless operator. In his 4 years service Houliston was attached to 16 different stations where he represented each at football. Playing in the Arbroath area the local side offered to sign him. On leave back in Dumfries Houliston declined the offer when taking instead a trial game for Queen of the South reserves. After an unremarkable debut against Falkirk ’A’ Houliston scored in the 4-1 victory over Celtic reserves. Like many that he was to score, his goal was eye-catching. Chasing a long ball up field Houliston beat Kelly in the Celtic defence. He then drew the Celtic keeper out and chipped the ball over the goalie’s outstretched leg and ran around him. With the keeper stranded, putting the ball into the net was a formality. Houliston was offered a contract. A month later, on 13th October 1945 Houliston made his first team debut, away to Morton. Nick named "Basher" due to his ’afraid of no one’ attitude, he was the idol of Palmerston Park in the late 1940s - his all action style meant sleep deprivation for defenders everywhere. 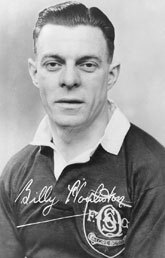 Houliston’s ex QoS team mate, Charlie Brown, recalled when interviewed by Bill Goldie in 2012, "It was indeed an honour to play in the same team as `Bustling Billy`. While playing in the blue of Scotland he helped his country to a memorable 3-1 victory over the `auld enemy` at Wembley and I`m certain he was never on the losing side at international level". On January 14th 1948 Houliston gained his first international recognition, playing for the Scottish League v the Irish League at Celtic Park. Playing beside George Young, Sammy Cox, Willie Ormond and Gordon Smith, Houliston scored twice in the 3-0 victory. His first was a header from a corner kick, the second a brilliant shot from just inside the box. On March 24th Houliston represented the Scottish League in the 1-1 draw this time away to their English counterparts. George Young scored for the Scots, Stan Mortensen for the English. Celtic then offered a big fee to bring him to Parkhead, but Houliston was happy to stay with Queens. Two more caps at League level followed, both against the League of Ireland. In the first game Houliston’s goal added to a Lawrie Reilly double for a 3-1 home win. A year later Reilly scored the only goal of the game played in Ireland. On 17th November 1948 Houliston made his full international debut. The Irish were 2-0 up inside five minutes. 22 minutes later Houliston met the ball on the turn 10 yards from the Irish goal and rifled the ball into the Irish net. A through pass to Jimmy Mason brought the equaliser. For the next goal Houliston passed the ball wide to Willie Waddell and then kept moving goal wards. He met the winger’s cross with a flying header for the comeback to be complete in the 89th minute. In Houliston’s obituary in ’The Independent’, the goal was described by politician Tam Dalyell as, "one of the best goals ever seen at the Glasgow ground". Before a crowd of 91,547, Houliston was Hampden’s hero of the hour. 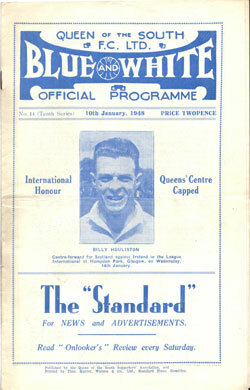 Five months after, on 9th April 1949, Houliston played against England at Wembley. Heroes everyone, Scotland comprehensively outclassed their opponents to return North with a 3-1 win in the bag with 98,188 fans watching. Scotland were 1 up at half time thanks to Jimmy Mason’s goal (the move started from Houliston’s throw in). 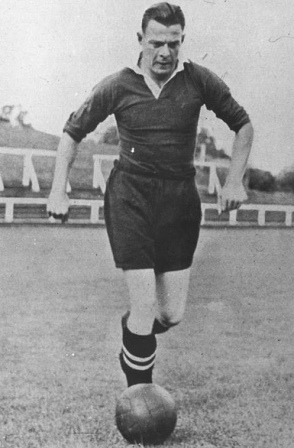 In the 52nd minute Houliston beat England goallie, Frank Swift, to Billy Steel’s through pass to square it with one left foot touch back to Steel. With the hard work now done, Steel will never have scored an easier tap in. Scotland’s third was Lawrie Reilly’s header before Jackie Milburn scored an English consolation goal. 10,000 fans greeted the returning heroes on their arrival at Glasgow’s Central station. 10 days later Houliston played for Queens in a friendly against Leeds at Elland Road. 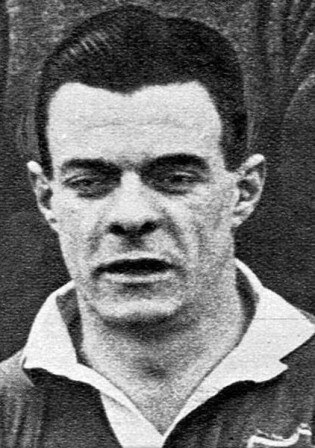 Houliston unwittingly became the first ever first direct opponent of a young debutant, John Charles who played at centre back that day. Now also a supreme legend with Wales and Juventus, Charles is remembered as one of the greatest all round players in the history of football. Houliston somewhat prophetically after the game said the 17 year old was, "the best centre-half I’ve ever played against". The game ended 0-0. Houliston’s last full cap was again in April ’49, before 123,970 fans at Hampden in the 2-0 win over France. Steel scored a goal in each half. That summer Houliston and his Scottish team mates toured the USA. Houliston netted twice in St Louis in the 6-0 win against the All Stars XI. Another Houliston goal followed in a 4-1 win against the American Soccer League in New York. However a serious ankle injury brought his involvement in the tour to a premature end. He journeyed home on the Queen Mary for an operation. An international career that had been progressing very nicely was now over. In all Houliston collected 9 caps at different levels scoring eight goals and never played in a losing Scotland side. In March 1950 Houliston played in a titanic Scottish Cup quarter final tussle. More comments from Charlie Brown, "It was Aberdeen at home but we found ourselves 3-1 down at half-time." Aberdeen were managed by Queens legend, Dave Halliday, with another Queens legend impressing highly for the Dons, George Hamilton. Aberdeen were three goals up after 15 minutes playing some fine football. A Doug McAvoy goal reduced the deficit back to two goals at the half way break. Queens unleashed a second half onslaught. Amid some frantic play, "Doug McBain raised our hopes when he netted 10 minutes from time to reduce the leeway and just a minute later Dougie McAvoy grabbed an equaliser." Houliston, playing out of position on the right wing crossed for McAvoy’s equaliser. Frank Watson in the Aberdeen goal pulled off an outstanding last minute save to force a replay back in Aberdeen. "Very few gave us a chance in the replay up at Pittodrie but we shocked them by winning 2-1 with Billy Houliston and Charlie Johnstone netting. In a spell of just eight days we`d met Aberdeen three times, including a league fixture, and actually stayed up there in the Granite City for eight days." Before a 32 000 cup tie crowd at Pittodrie, in the 28th minute Aberdeen again went a goal up before Houliston (playing at his preferred centre forward after a tactical reshuffle during the game) lashed home the equaliser from a McAvoy pass. A minute later Queens were ahead for the first time in the tie - McAvoy again the provider for Johnstone this time to trouble the score keeper. Charlie Brown again, "We were now into the semi-final of the Scottish Cup and what seemed to be half the town of Dumfries made for Hampden by train, bus and private cars. Unfortunately I wasn`t playing that afternoon which was a major disappointment but I was still there to cheer the lads on. We were actually leading 1-0 with a goal from Jackie Brown, but a defensive mix-up between our keeper Roy Henderson and Dougie Sharpe saw Rangers grab an equaliser. The gate that day was 53,000." The semi final tie at Hampden on April Fools day against Rangers would go down as a Scotttish Cup classic. Disaster struck for Queens in the first minute. In the era before substitutions Doug McBain’s injury reduced Queens to playing the rest of the game a man short. Regardless, 10 man Queens knuckled down and got on with it. In the 43rd minute Houliston, spraying the ball wide from midfield saw Rangers Willie Woodburn unable to block out the pass. The ball fell to Jim Patterson who fed Jackie Brown. Brown’s sugar finish from 15 yards gave a half time score - Queen of the South 1, Rangers 0. Rangers bundled equaliser came in the 59th minute. Houliston had a last minute chance to put Queens through but the game ended 1-1. During Houliston’s time as a Queen of the South player they spent only one season out of the top division of Scottish football. That season was the Scottish B Division championship winning season of 1950-51 with a first ever League Cup semi final appearance that year thrown into the bargain. Details of that season are listed in the Queens Legends profile of Jim Patterson. Houliston left Queens with a tally of 60 goals in 120 league games and 74 strikes in total from 155 first team games - 13th in the club scoring chart. "For a while we lived in Dumfries. This was during the war and my father was working at an RAF maintenance station. The local team was Queen of the South. Queens were my team. My hero became Billy Houliston, an old-fashioned, bullet-headed, barge-the-goalie centre-forward who played for Queen of the South who got three full caps for Scotland. I lived in Dumfries for four years. Queens having got to the Scottish Cup semi-final for the first time in 58 years, I remember the last one well." As well as marking the end of Houliston’s international career, the ankle injury blighted his club career also. Queen of the South released him in July 1952. While holidaying in Blackpool he was pursued by dignitaries of Berwick Rangers. A contract was offered and Houliston signed while still on holiday. He spent only one season at Berwick where fate meant the club were drawn to play against Queen of the South in the Scottish Cup. A last minute goal gave Queens a 3-2 victory. It was this game that led to one of Houliston’s Berwick team mates joining Queens to great effect, Jimmy McGill. Houliston then had a brief spell with Third Lanark before hanging up his boots in 1953. "Today another chapter in the Queen of the South story closes. Today Queens meet Clyde in the last day of the 1961/62 season, with promotion to the first division next season already assured. In my playing days at Palmerston, I experienced many moments of pride, but none more so than today, as Chairman of this popular club." Queens wrapped the season up in style beating divisional champions Clyde by 3-0. The team that season included Player Manager George Farm, Neil Martin, Ernie Hannigan, Iain McChesney, Jim Kerr and the now veteran Jim Patterson. Houliston’s son, Keith, also represented Queens as player and director. This article was the first on qosfc.com profiling Dumfries born ex Scotland full internationalists. Related articles as part of that series have now been added on Barry Nicholson, Bobby Ancell, Dominic Matteo and Willie McNaught.